We have a search engine for videos and images, and there is always room for another to add more variety to each. When it comes to the Web, Twitter has a lot coming its way and hence we have Tweepz: a search engine to find people on Twitter based on Exalead’s core technologies. Simply enter the name, bio of a person you are looking for and Tweepz brings out the closest possible matches. Tweepz is currently indexing just over 2.5 million Twitter users (follow @tweepz to be added to the database) and aims to make finding people who interest you an easier task. 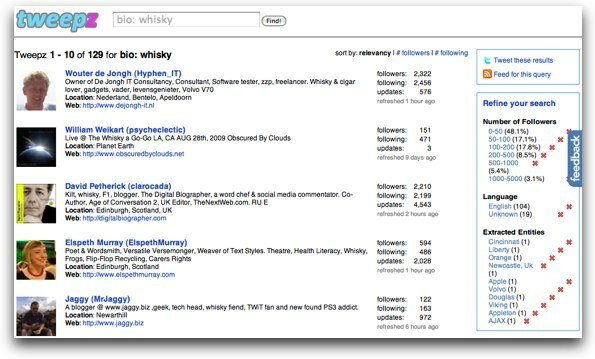 Tweepz not only lets you search by geography, biography or name, but also hopes to index the content of Twitter users’ nominated URLs in the future, thus offering a larger scope and capacity to return meaningful search results. But Tweepz takes it further than that! You can also filter your results. You can narrow your results by number of followers, the language they speak or extracted entities (key words which show up in their bios) all of these divided into percentile ranges. RSS feeds for specific queries are available, as is the simple ability to tweet the results you are seeing. Test Tweepz.com and give us your feedback! Exalead’s blog has a new look!